At first I was pretty happy with the stock pipe on my BMW R1200 GS, but after about 7,000kms I knew it had to go; it just didn’t have the character, or note, that I liked. 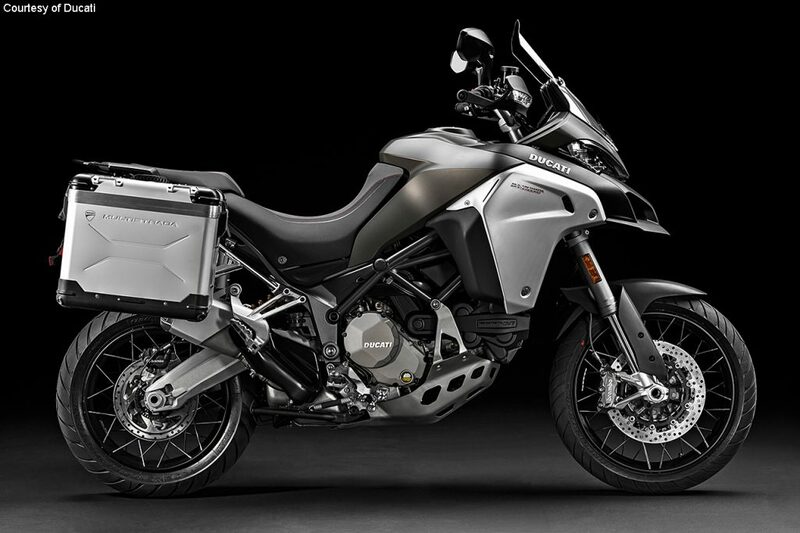 I really wanted that angry twin note, I basically wanted it to sound like my old Multistrada. Thumpy, angry and loud! The Multi came secondhand with a full Termignoni system and I have to admit it was my favourite note, favourite engine, favourite bike I have ever owned. Up until last November when I got the GS 😛 I still love the Multi and admittedly I cannot WAIT to see/test/ride/hear the new Multistrada Enduro X. That should be one hell of a beast that could really go head to head against the BMW GS, maybe even in the dirt. I guess that’s what Ducati are counting on too. I have no intention of trading up, or moving on from the GS for four years, at least that is what I have told my broke self, but I do have the winning numbers in the $40 Million lottery next week so one might get ‘added’ to the shed anyway. One thing was quite clear to me as I begun my search for the pipe of choice on my GS. A flat twin is never going to sound like an L-Twin, or a V-Twin. Being a vertically opposed engine means it will just never achieve that kind of cracking thump. Confused by this, I asked a die hard beemer fan, and several friends when an online mate I have come to admire greatly for his engineering knowhow, explained some science behind pipes, and I think it’s worth sharing, with permission of course. Thanks Lordy for the continued engineering lessons mate, top stuff. A lot of these videos don’t really help that much, but at least you can kind of get an idea how they sound. 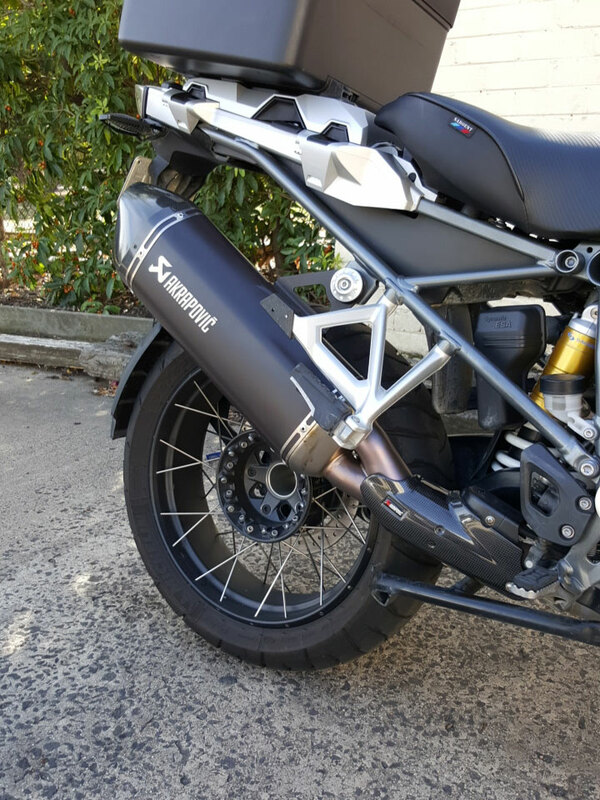 I have always liked the premium brand of Akrapovic, and as BMW has done the R&D on them fitted to the actual bike, it kinda made my decision pretty simple. Then I discovered that they came in black. Matte Black. The best kind of black. That did it, I was sold. A few quick searches on different online shops and I soon realised there was literally no savings to be had in trying to source one online. I found a couple of really cheap Arrows on eBay, but I was concerned about their legitimacy and also shipping.The Arrow also has a much smaller profile and to me it made the bike look out of whack. It’s kind of a big pain in the arse being ten million miles away from the rest of the world, shipping can really sting. So off to my local dealer and the origin of my bike revealed that they could indeed be a little competitive for my business, so with a just discount, I had ordered exactly what I wanted from the dealer and within 3 days it was in my hands. Bling! Installation was piss easy. Two bolts, slip the old one off, a bit of fiddling with the carbon cover and slip the new on one. Job done. 30 mins tops. You can see a bit of glue that has heated up and leaked a bit, checked that out and it turns out to be pretty normal, or so they say. Some WD-40 and it will wipe off. The new pipe sounds great. It’s definitely deeper than the stock pipe, which by all counts surely is a very decent stock muffler, but meh. I wanted more black. Quadruple Black? So it’s a deeper sound down low, it isn’t super loud (could definitely be louder), but it kind of zings, instead of claps like the Termi on a Ducati. It has a really nice note up through the revs heading towards the red line, but it quietens out. It doesn't get louder, it gets quieter, which is why it's called a Silencer. Hard deceleration is where it is all at. I like a good bit of engine braking, and the auto-blipper makes a good crackle and pop as you push down through the gears. Noice! It’s a slip-on. A bloody expensive one ($1435 AUD). It looks tuff. It sounds better than the stock. It’s an Akra. What’s not to like? Ultimately pipe choice is personal, this probably isn’t that helpful to anyone trying to work it out for themselves, but that’s what you have to do when you boil it down. Until next time, ride on.